I can’t believe it’s that time in the year where we officially move on from pumpkin lattes to Thanksgiving sides. Soon to be followed by Christmas cookie everything. Weren’t we just discussing back-t0-school snack ideas? But, here we are, middle of November and my brain is focused on that ever-so-important Thanksgiving menu. I guess I sort of get a pass this year as our Thanksgiving will be spent lounging in Vegas, eating at my favorite Food Network star’s restaurant. But, since I can’t not celebrate, we are hosting our pre-Thanksgiving feast next weekend. After talking to my clients this week, I know I am not alone in my ambitions for beautifully set tables, perfectly cooked sweet potato casserole and baskets of parker rolls. I also know my clients are focused on making their Thanksgiving menu both healthy and economical. 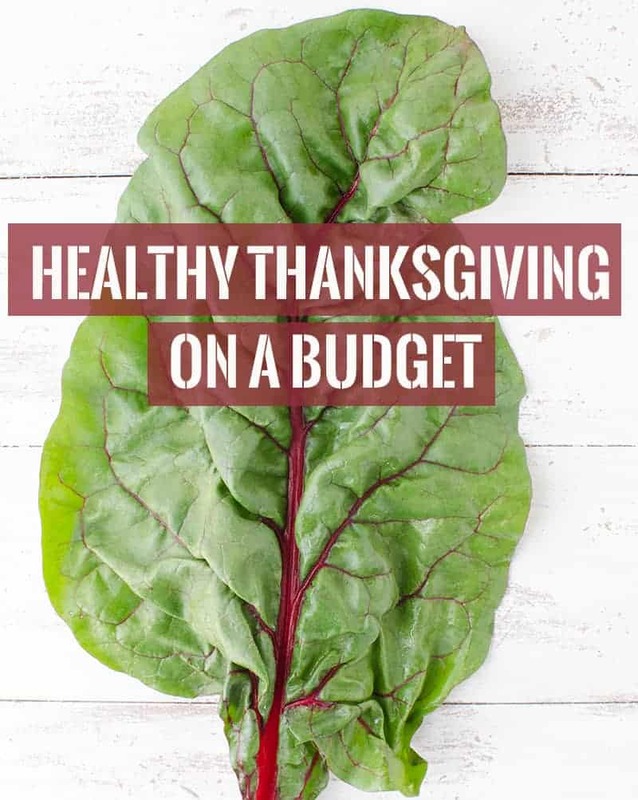 A budget friendly Thanksgiving was something I never thought about until I planned my own a few years ago. How do we all do this? While there were only the four of us eating, our grocery bill easily topped $100, without even factoring in the wine. Since this topic tends to be something we think about- but don’t talk about– I wanted to share with you my top tips for a healthy Thanksgiving feast that won’t break the bank. First step? Check out this handy in-season produce calendar. While this is something I consult year round in making healthy, budget friendly choices, it’s a must for Thanksgiving. I love asparagus as much as the next food blogger, but this isn’t the time. Brussels Sprouts are my favorite in-season vegetable to feature for Thanksgiving. Not only is the pop of deep green gorgeous on the table, but sprouts are very affordable. Quartering them not only increases the amount of perfectly crisp sides, it also helps the dish go further. In the summer, when I have basil, parsley, and mint growing out of my ears, I relish the use of fresh herbs in just about everything. But now that my herb garden is dead, I happily swap in dried. Besides being a fraction of the price, dried herbs can pack a ton of flavor. Make sure to add them in the beginning of the recipe, so they have enough time to infuse their flavors while cooking. While dried tends to be less expensive, don’t discount fresh herbs either. Sometimes spending $2 on fresh herbs can be a better bargain than a jar of dried herbs that you know you won’t use again until next year’s Thanksgiving. Go for the store brand! I started grocery shopping this way in college and haven’t looked back. Rarely is the brand name a better option than the store brand. There are a few exceptions to this rule, but for the most part, you can save major bucks each shopping trip by choosing generic over the brand name. As someone who hosts dinner parties wayyy more than my husband would like, I know the pressure of wanting to do it all. But sometimes, it can be draining to both your wallet and your energy. When people ask to bring something, let them. Since I love planning my menu and cooking, I let my guests bring the beverages. Not only does this allow them to feel like they are contributing, but it also helps cut down on my wine costs. 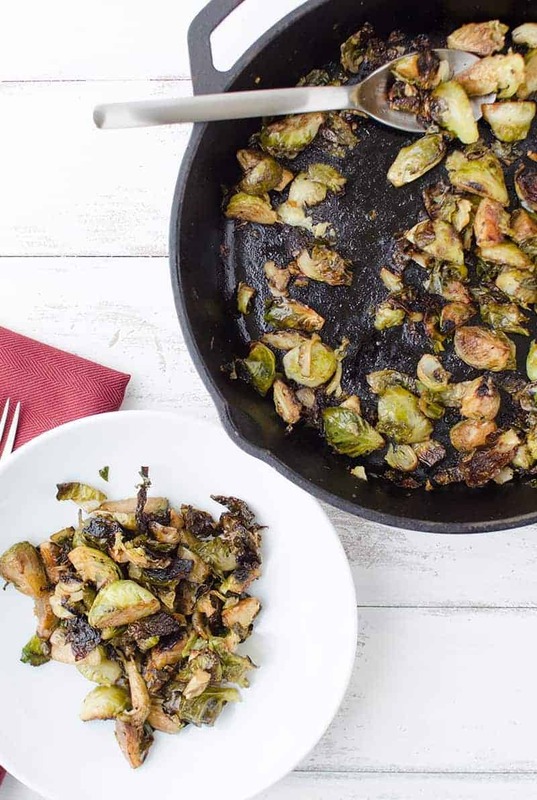 For my early Thanksgiving celebration next week, I’m inviting friends over to relax, play games and feast on favorite Fall foods- including these Roasted Balsamic Sprouts. I cannot say enough great things about these sprouts- they are unreal. And simple. And the ingredients costs less than $5. Crispy little leaves, browned to perfection and tossed with a splash of balsamic vinegar. 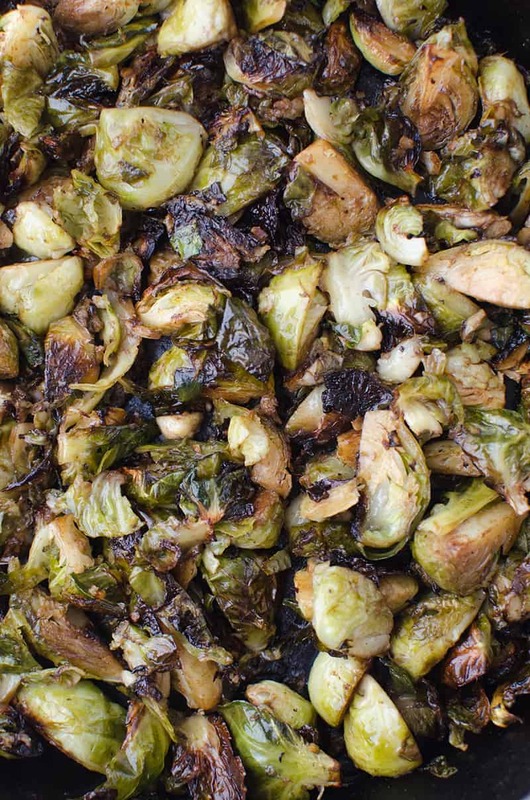 The tangy vinegar pairs perfectly with the earthy taste of roasted brussels sprouts. 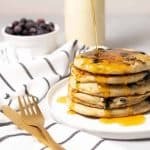 They are a must on my holiday table and I can’t wait for you to make them! What are you planning for Thanksgiving? What’s your favorite budget tip when hosting a holiday dinner? The perfect side dish for Thanksgiving! 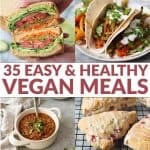 Inexpensive and healthy! 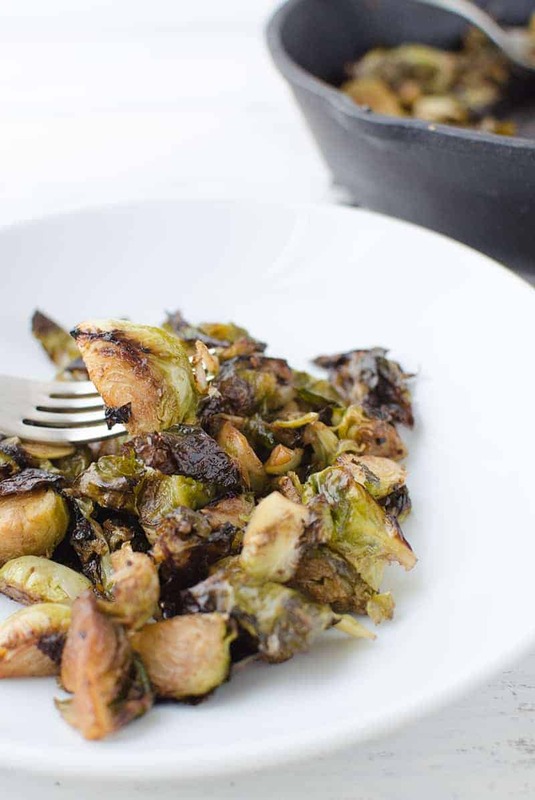 Even if you think you don’t like brussels sprouts, you must try this recipe! Preheat the oven to 450 degrees F. Heat the oil over medium heat in a large oven-safe skillet, like a cast-iron pan. 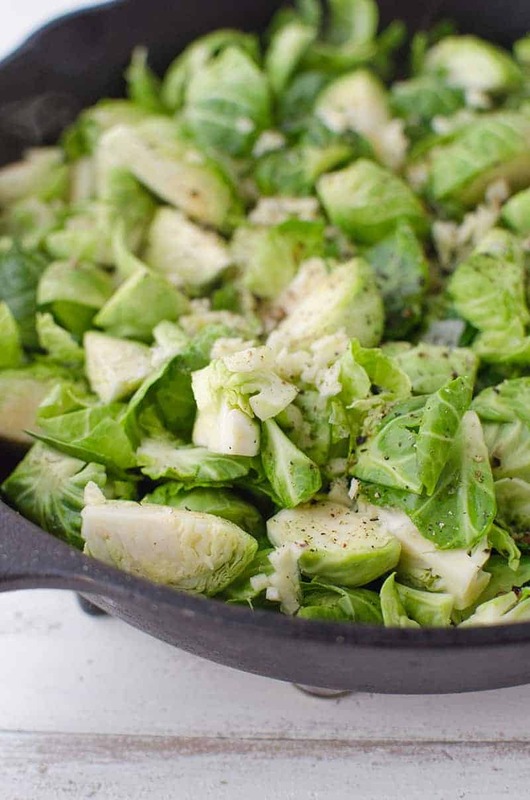 Add the brussel sprouts to the pan and sprinkle with garlic and a pinch of salt and pepper. Let cook, without stirring, for 5 minutes. You want the sprouts to get good and brown. Stir and place the brussel sprouts in the oven until brown and tender, about 30 minutes. Drizzle with balsamic vinegar and season to taste with salt and pepper. These are awesome tips! I especially love the one about choosing seasonal foods. That’s something I need to do more of all year round. I’ve never hosted a holiday meal, but always try to contribute in some way if I can! Great tips! I am a huge, HUGE fan of roasted brussel sprouts. Especially with some balsamic vinegar! You read my mind. It’s the crispy brussel sprout chips I can’t get enough of. The little leaves that flake off? I could eat a whole bag of those like potato chips, haha.